For scholarly work Open Access means making peer reviewed scholarly manuscripts freely available via the Internet, permitting any user to read, download, copy, distribute, print, search, or link to the full text of these articles, crawl them for indexing, pass them as data to software, or use them for any lawful purpose, without financial, legal or technical barriers other than those inseparable from gaining access to the internet itself. These definitions were first proposed more than 15 years ago in Berlin and Budapest. Importantly, open access is more than just free access. 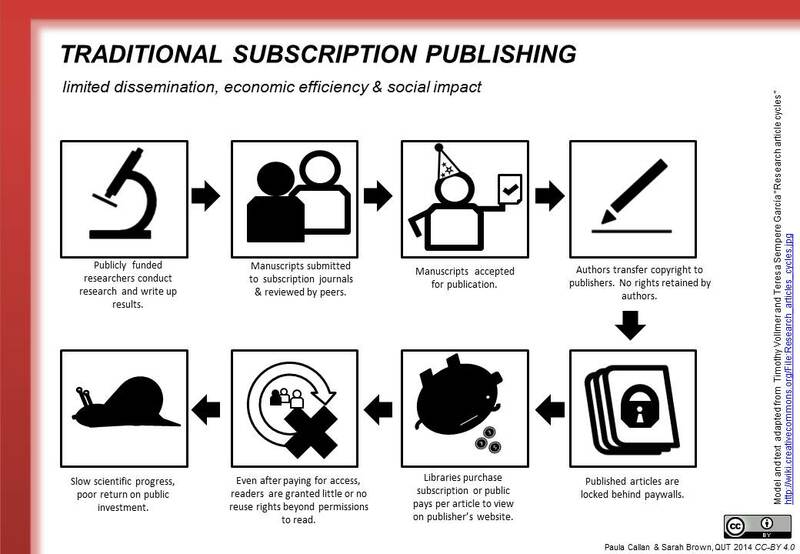 While the majority of journals are now published online (many exclusively), often they are only available to people who pay a subscription or who are members of an institution who pays a subscription. Open access uses digital technology to make research findings widely available. 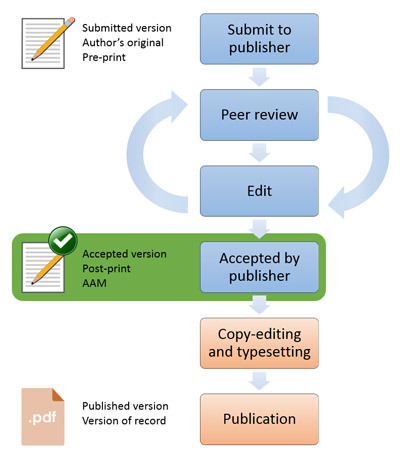 Researchers can make their work open access by one of two ways; by depositing an open access copy of their published work in a repository or by publishing in a journal that makes the work open access. The scholarly communication system is fundamental to the pursuit of research. Researchers formally share the results of their work by publishing it in the academic literature. This primarily can be in the form of research papers, conference papers or as books. The research for most journal articles produced in Australia and New Zealand is undertaken in publicly funded universities. Researchers write up the results of their work and submit papers to journals or conferences. These are assessed by editors and sent out for peer review, before being revised by the author(s) and finally published. Researchers do not receive payment or royalties for their published articles. In addition, the tasks of peer review and editing are considered to be part of the scholarly process and are undertaken by researchers without payment. Once the work is published, institutional libraries (which are publicly funded) pay large amounts for subscriptions to journals. This means that people affiliated with these institutions can access the research for free but those without an affiliation or another subscription cannot. Practitioners such as pharmacists, teachers, nurses, business people are unable to see the latest developments in their field without paying substantial amounts in subscriptions. 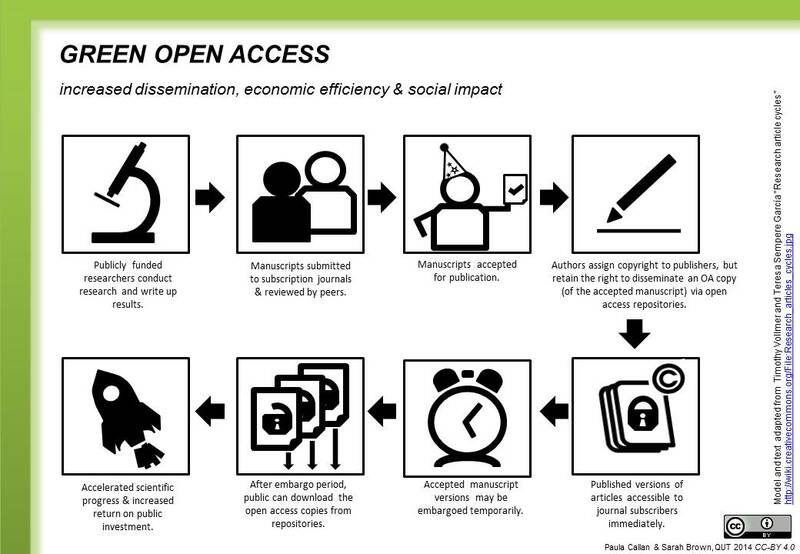 What is ‘green’ open access? Researchers can deposit a version of their published work into a subject-based repository or an institutional repository. This is referred to as ‘green’ open access publishing. Examples of subject-based repositories include such as arXiv in the high energy physics and mathematics disciplines, Social Science Research Network (SSRN), Research Papers in Economics (RePEc) and PubMed Central. Every university in Australia has a repository for this purpose. 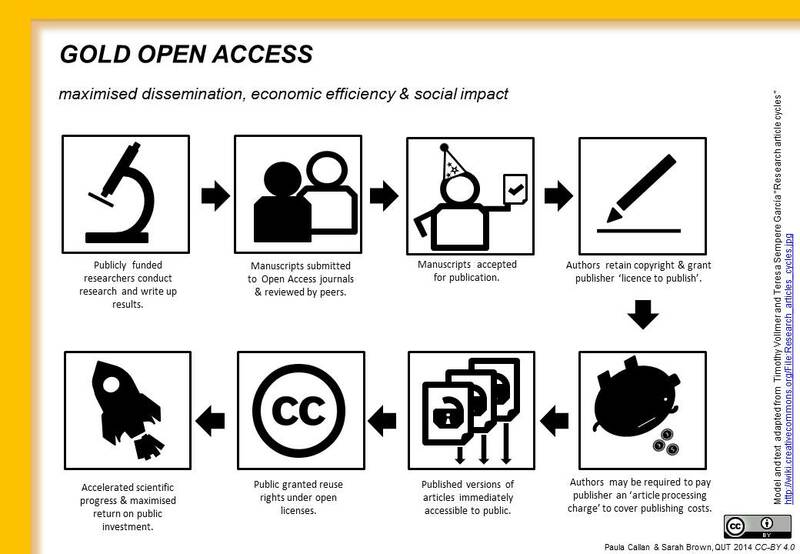 What is ‘gold’ open access? Alternatively researchers can publish in an open access journal, where the publisher of a scholarly journal provides free online access to the full content of the journal. Business models for this form of OA vary. In some cases, the publisher charges the author’s institution or funding body an article processing charge (APC). All Public Library of Science (PLOS) journals use this model. This is referred to as ‘gold’ open access. The best list of gold OA journals is maintained by the Directory of Open Access Journals. There is also a Directory of Open Access Books. What is ‘hybrid’ open access? Hybrid open access occurs when an article processing charge is paid for an individual journal article to be made open access in an otherwise subscription journal. This type of open access is invariably expensive and is not supported by any universities in Australia and New Zealand. What about “bronze” and “black” open access? This article discusses the frequency of all the various types of open access, including “bronze” open access (a freely available journal article with no license) and “black” open access – illegal open access.